(Source: latinoreview.com) The Federal Communications Commission (FCC), saying it was “in the public interest” today approved a request by the Motion Picture Association of America, Inc. (MPAA) to permit recent movies to be sent directly to American households over secure high definition transmission lines from their cable or satellite providers prior to their release on DVD or Blu-ray. The Blu-ray and two-disc DVD TRANSFORMERS: Revenge of the Fallen packages also will feature augmented reality technology that will allow owners to interact with a holographic image of OPTIMUS PRIME utilizing their webcams and a special website. Fans will be asked to piece together the Matrix of Leadership to bring OPTIMUS PRIME back to life, help repair his armor and calibrate his weapons by actually controlling his aim during target practice. (Source: io9.com) In case you were thinking that the deleted scenes filling all those plot holes were the only reasons to buy Star Trek on DVD, Paramount reveal that they want to use it to bring you on board the Enterprise. (Source: techradar.com) Sky’s 3D guru, Brian Lenz, has told TechRadar just how important James Cameron’s forthcoming blockbuster movie Avatar is in bringing 3D to the home audience. Head of Product Design and Innovation, Lenz is championing Sky’s already impressive foray into broadcasting 3D and he explained in a lengthy interview for TechRadar that the company is learning lessons day by day in how to get the perfect footage. But although he insists that the public are ready for 3D broadcasts for key events, he confirmed that Cameron’s Avatar will be a ’significant moment’ in his goal of bringing 3D to people’s homes. This is a motorized, fully-articulated R2-D2 projector with built-in DVD/CD player, surround sound system, iPod Dock, connections for every kind of media input, USB, multi-flash card readers, AND it includes a Millenium Falcon remote control. Oh, and it will ‘lie’ back to 260 degrees of rotation to project on your ceiling. Trust me, you can only fully appreciate the scope of what this can do if you watch the video. Only $2995. (Source: cinemablend.com) Coraline is still in theaters, but we know that it’s never too early to start thinking about the DVD release. Our own Josh Tyler got the chance to talk with Henry Selick at SXSW and the movie’s director shed some light on what we can expect to see once the animated movie comes home. While the standard for 3D on Blu-ray is still up for debate Panasonic could be working close with James Cameron on his “Avatar” as the first Blu-ray release to feature the company’s 3D technology. “Avatar” will be released in theaters this December but industry insiders says that Panasonic could be involved in releasing a 3D Blu-ray version of the movie as early as Easter 2010. Lately Panasonic have been using clips from the SIFI epic when demonstrating their 3D capabilities in a possible upcoming home market. Apple’s new MacBook lines include a form of digital copy protection that will prevent protected media, such as DRM-infused iTunes movies, from playing back on devices that aren’t compliant with the new priority protection measures. 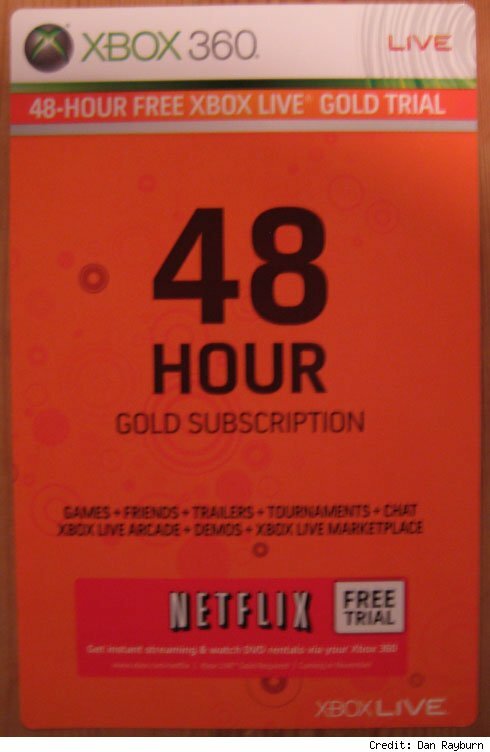 It looks like the new Quantum of Solace game for the Xbox 360 has a little something extra bundled in with the package: according to reports, an explosive 48 hour Xbox Live Gold trial membership card with a secret “Netflix code” on the back is included. Nobody seems particularly stunned to hear that the companies plan to aggressively push the streaming movie service when the NXE goes live on November 19th, though no other details of the trial have emerged yet. There does seem to be ferocious agreement, however, that it’s at least somewhat possible trials will appear with other high-profile games, too. - There may be bugs. We are logging all errors, but if you run into problems you can help out by posting details here in the blog comments. - Not all movies are available to watch with Silverlight. You may notice errors or lower than normal quality when watching certain titles. - Our new player works on PCs and Intel-based Macs. - Windows users should be aware that if you opt in, you will need to use Silverlight on all the machines you use to watch instantly. Netflix previously announced that they had begun limited beta testing of the new Mac service and expects the final release to be available by the end of the year. Netflix is best known for its mail-order DVD rental service but also includes unlimited video streaming with their fixed monthly plans starting at $9/month. Up until now, this streaming service has not been Mac compatible.